The Saudis’ closest allies, Morocco and Pakistan, are on Qatar’s side, angering the United States. No signs of war disturb the normal pace of life in Dubai. The ongoing crisis between Qatar and its neighbors, UAE and Saudi Arabia, seems to have made little impact on everyday life in this major city of the United Arab Emirates. Qatar’s emir has decided to recall his forces that had been on a peace mission between Djibouti and Eritrea. Turkey’s parliament has authorized the deployment of 5,000 troops to join the 90 soldiers who are at a former British base near Doha (Qatar). Qatar has put its military on the highest state of alert. Nothing like this is in evidence in the UAE. It is Ramadan. The days are quieter and the nights more vibrant. Dubai’s many malls bustle after the iftar meal. Families stroll past the shops, greeting friends and snacking with great gusto at the food courts. Talk of Qatar is not welcome. It is forbidden in Dubai, as in the rest of the Emirates, to offer sympathy toward Qatar. But there is no sense that the UAE and Saudi Arabia would invade Qatar. “There is absolutely no military component to anything that we are doing,” said the UAE’s Ambassador to the United States Yousef al-Otaiba on June 13. Evidence on the ground to contradict him is not apparent. There are currently 10,000 US troops at the al-Udeid base in Qatar. It would be impossible for these troops to remain immune from any potential Saudi-Emirati invasion of Qatar. It is likely that these U.S. troops—despite what President Donald Trump says—are Qatar’s insurance policy. Gossip in the higher circles in Dubai indicates that the Emirates and the Saudis would put more economic pressure on Qatar so that it comes to heel. What is desired, said one Emirati officials, is for Qatar to become like Bahrain: to be a political subsidiary of Saudi Arabia. This policy is known as Bahrainization. Saudi Arabia has long wanted to break Qatar’s independence (as I noted in a report last week). It would like Qatar to become like the kingdom of Bahrain, whose dependence on Saudi Arabia is virtually total. Word comes that the Saudis would like to see the current emir, Sheikh Tamam bin Hamad al-Thani, his father the former emir and his mother removed from power. The emir’s mother, Sheikha Mozah bint Nasser, particularly rattles the Saudis. It is Sheikha Mozah who has led the drive for Brand Qatar, building not only Education City as a premier site for higher education in the region but also the Qatar Philharmonic Orchestra and Qatar’s media expansion. It was Sheikha Mozah’s advisor, Mahmoud Jibril, who drew NATO to overthrow Libya’s Muammar Qaddafi (the release of Qaddafi’s son Saif during this current crisis suggests the width of the claw-back against Qatar). Sheikha Mouzah has long been a target of the Saudis. A decade ago, the Saudi-backed London-based newspaper Azzaman accused her of being in contact with the Israelis. She won a libel suit against the paper. At the time, the Saudi dissident Sa’ad al-Faqih, who heads the Movement for Islamic Reform in Arabia, defended Sheikha Mouzah. Now word slips out of Saudi Arabia that Sheikha Mouzah has funded Sa’ad al-Faqih and other movements for the overthrow of the Saudi monarchy. No official complaint has been made by Saudi Arabia. But sometimes rumor is far more effective. Turkey’s President Recip Tayyip Erdogan said on June 13 that the isolation of Qatar is ‘inhumane and against Islamic values.’ Erdogan knows that what befalls Qatar will soon strike Turkey. Both are patrons of the Muslim Brotherhood, and both are therefore targets of Saudi anger. This is why Turkey’s government has taken a decidedly pro-Qatar position. It has now sent a team to Qatar to evaluate the emirate’s defenses and to assess its own troop deployment. More bewildering is to see two of Saudi Arabia’s closest allies, Morocco and Pakistan, offer support to Qatar. Morocco’s King Mohammed VI has said he would send aircraft filled with food to help the Qatari citizens. Qatar imported 80 percent of its food from Saudi Arabia and other neighboring Arab states. These food supplies are essential. Rumors began to fly about that Pakistan was going to send 20,000 troops to defend Qatar. The frenzy of this story was so intense that the Pakistani Foreign Ministry had to deny these rumors. On June 12, Pakistan’s Prime Minister Nawaz Sharif met with the Saudi King Salman to help mediate the crisis. The King asked Sharif bluntly, ‘Are you with us or Qatar?’ Sharif said that Pakistan would like to take no sides in this crisis. This is the second time that Pakistan has let Saudi Arabia down. The first time was when its parliament refused to allow Pakistani troops to fight in Saudi Arabia’s Yemen war. Iranian aircraft have already delivered food to Qatar, while Qatar Airways planes use Iranian airspace rather than Saudi airspace to get to Europe. Iran’s leadership has welcomed Qatar’s distress as its opportunity, since the Saudi-Emirati conflict against Qatar weakens the anti-Iranian bloc of the Gulf Arab states. In Moscow on June 11 Qatar’s foreign minister Sheikh Mohammed bin Abdulrahman al-Thani offered warm words about Iran. ‘Everyone wants positive relations with Iran. Iran is a neighbor,’ he said. Saudi Arabia, at the urging of the United States and Israel, has pushed Qatar to deny support to the Palestinian political and military group Hamas. Qatar’s entire policy toward Palestine is funneled through Hamas, which is the Palestinian section of the Muslim Brotherhood. Hamas’ main political leader, Khaled Meshal, lives in Doha and is close to the Qatari ruling family. Iran and Hamas had broken ties over their interpretation of the Syrian war. But in June of last year, Hamas renewed its links with Iran. Hamas’ Moustafa Mohammed Abu Marzook, who had been harsh in his attacks on Iran in early 2016, praised Hamas on al-Aqsa television on June 15 of last year. ‘The support offered by Iran to the Palestinian resistance,’ Abu Marzook said, ‘is unmatched.’ Both Qatar and Iran share the view that Hamas is a legitimate arm of the Palestinian resistance movement, a view that they do not share with Saudi Arabia and the Emirates. Russia, which has close ties with Iran, has sought to use its influence in the region on behalf of Qatar. Russia’s President Vladimir Putin met with the UAE’s Crown Prince Mohammed bin Zayed al-Nahyan on June 14. This came after Putin spoke to Qatar’s emir. Kuwait is formally conducting the mediation, but pressure from Russia is, I am told, helping convince the UAE in particular not to prolong this crisis. Qatar Ports Management used to work closely with Dubai’s port for shipment of goods. During this crisis, Doha’s Hamad Port began direct services with Oman’s Sohar Port. Two Iranian warships sit at Sohar. This will not have a major impact on Dubai’s economy, but any sign of wear is troubling. Construction, which slowed down after the financial crisis of 2007-08, now booms. Cranes disturb the skyline of this impatient city-state. The city’s financial elite would like to see the conflict wind down. Alserkal Avenue in Dubai, the center of its arts, thrives during Ramadan. At the Ayyam Gallery, the Syrian artist Abdalla al-Omari has a show called ‘The Vulnerability Series.’ Al-Omari depicts world leaders as refugees, powerless now, carrying their few belongings, distraught. 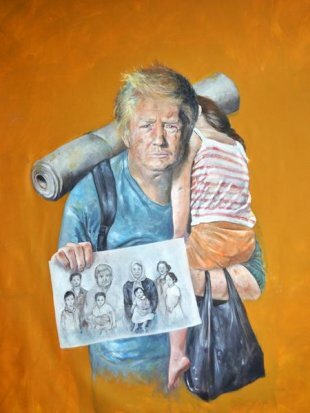 One of his paintings is of Donald Trump. It is a moving image. Nearby in other paintings are Bashar al-Assad of Syria and Abd el-Fattah el-Sisi of Egypt. But no images of any of the emirs of the Gulf or of the King of Saudi Arabia: the UAE forbids any criticism of its rulers. Disclaimer: The views expressed here are the author’s personal views, and do not necessarily represent the views of HalalFocus.